For reference, 5342 miles is the distance it would take sound approximately 7 hours to travel, or 1.4 times the length of the Amazon River. Of course, distance is somewhat irrelevant with the Internet, but it sounds more impressive that way. So, on to how it all started. I got a message saying “hi, something is wrong with my computer”. We’re okay so far – that’s a fairly regular occurrence in the life of someone in a technology-related field. Then she told me it wouldn’t go past the very first screen. After a few questions, I figured out she meant the BIOS boot screen, where it does the POST. She had already rebooted several times to no avail. So, the next course of action was to get to the CMOS/BIOS settings and see if we could reset them. After some trial and error, she reported that she couldn’t get that to come up (being a Thinkpad, all you should have to do is press the ThinkVantage button). It was starting to look really bad. At this point, I just about gave up and decided that her motherboard or some other crucial hardware component was failing and that she needed a new laptop. Fortunately, I turned to Google instead. With a bit of Google-fu and following a few links, I found this somewhat sketchy page (the link is now dead), which explains in broken English that a broken USB port can cause a Thinkpad T400 not to boot. I’m not entirely sure why I didn’t click past that page immediately. Perhaps I looked into it because I remembered her mentioning using a USB drive earlier in the day. Maybe it was because at this point I had gone through just about everything else I knew to do to debug the problem. At any rate, I continued our game of 20 questions by asking her if any of her USB ports looked broken, or like they had pins that were bent in a way so that they were touching each other. It took us a bit of back-and-forth to iron out which port was the USB port she had plugged the USB drive into earlier in the day, and to identify any other USB ports which may be the damaged culprit. She reported that she had one USB port, and another port beside it that wasn’t quite the same. After some more questions back and forth, we established that the other port was indeed a USB port, but that it was missing the plastic middle piece, much like what the sketchy link described. After she managed to take and send me a picture over her fairly slow Internet connection with the friend’s laptop she was using, I began to hope that there might actually be something to this. 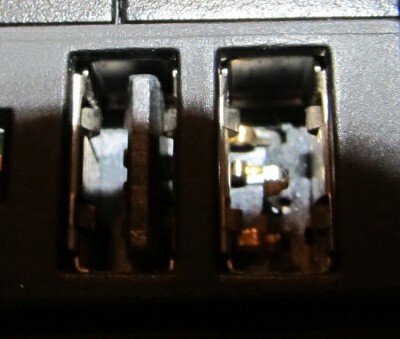 The pins in the second USB port were all bent over, and were almost certainly shorting out when she tried to boot it. She began attempting to straighten the pins with tweezers and a sewing needle. After she managed to get the pins straight enough so they weren’t touching each other or the grounded sides of the port, she tried to boot the laptop again, and it worked! I am quite proud of the fact that we managed to debug and fix a seemingly defunct laptop from opposite sides of the equator, using only instant messages and one picture.